People who search locally have a greater than 80% chance of actually going to a store and buying something. That’s a pretty high chance. With those odds, it’s definitely worth it to market to them. Luckily, we’ve got just the thing for this situation. Hyperlocal marketing is a targeted form of marketing that focuses on reaching local, motivated buyers. It’s aimed at the people in your area who are ready to buy your products and services. Businesses with both an online and offline presence are in a great position to take advantage of hyperlocal marketing. In this post, we’ll share 8 simple but powerful ways your business can use hyperlocal marketing to quickly boost sales. 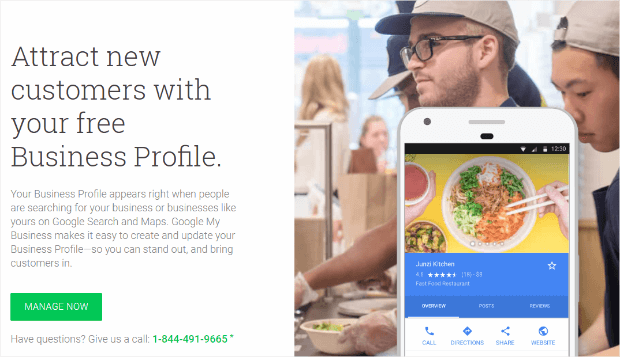 Google My Business is a free, easy-to-use tool that helps businesses manage their online presence and appearance on Google Search and Google Maps. It’s easy to set up a Google My Business listing. Just visit Google My Business, click “Manage Now,” and start filling in your business info. To optimize for relevance it pays to be specific. Google wants to make sure that the businesses ranking locally are actually local businesses. Fair enough, right? Because of this, we recommend that companies create landing pages for each location you have a site or local representation and link them to their Google My Business profiles, as well as their other profiles on the web. So, if you have a restaurant in West Palm Beach, you’ll definitely want to create a landing page just for your West Palm Beach folks. Optimizing for prominence is all about attention to the details: images, reviews, citations, and links should all be high-quality. Offline and eCommerce shops can benefit from optimizing their sites with location-based keywords. Location-based keywords are anything that directly relates to your location. The city name is an obvious one, but there are so many more. If you were based in St. Louis, you’d want to talk about The Arch, Cardinals, anything Gateway. For Seattle, it may be the Space Needle or references to the “Big Apple” in New York. You can use these keywords in product descriptions, company profiles, or service delivery areas and they should show up naturally in the headlines and text of your pages. If it doesn’t sound like something you would say out loud to someone in natural conversation, it probably doesn’t belong on your site. All these methods help Google find you and will help you rank higher in search results. This may seem like an obvious one, but we’ve seen many a site without their contact info or location on their website. Even if they have a local store! Along with location-based keywords, including your contact info goes a long way to make you easily discoverable by search engines. To make it easy, put all of your contact info in your footer, so it shows up on every page. People find consistency comforting. And that makes brand consistency a big deal. It’s why all food from corporate-owned chain restaurants tastes the same. If you don’t believe us, just ask Pepsi. They practically have to issue a public apology every time they change their logo. Did You Know: OptinMonster popups are fully customizable, making brand consistency a breeze! Get started with OptinMonster now! Maintaining brand consistency can be difficult when you have a distributed brand or a brand with both an online and offline presence. Create high-quality marketing materials and store them in a single place that’s available to all locations. You can even provide templates and a marketing guide for locations that need to occasionally personalize these materials. If you’re a distributed brand there are going to be differences in the marketing language, or even product offerings, that connect with local customers. McDonald’s, for example, releases different menu items in different locations, like the shrimp beef burger in South Korea or the haupia pie in Hawai’i. Use feedback from customers and employees to figure out what different marketing assets they may need in different locations and create them in line with the rest of the brand materials while including the local flair. Set a policy for local partners that you will print the smallest quantity of printed materials needed. Additionally, let local partners know when you’ve changed or retired a marketing asset. Recycle the old printed materials once an asset has been changed. You can’t use the old ones and still hang on to brand consistency. Always keep your digital assets up-to-date and easily accessible. If you’re a local brand that also sells online, creating authentic local content won’t be a problem. These are your people, after all, in your hometown. But, if you’re a regional brand reaching into a local market it can be difficult to sound like you really belong. The best way to create the content you need, and the only way to do it authentically, is to hire local talent to create the content for you. Having a local voice behind your blog posts, videos, ad and email copy, and all of your social media posts will go a long way toward increasing trust and building relationships. Your website and social media profiles should be showing up in local searches for the areas you’re targeting. If they aren’t, you’ll need to put some time and effort into local optimization strategies. The name, address, and phone number you use should be the same throughout your website to ensure that search engines are getting the right info. After you have your own site sorted out, look at other sites listing your contact info. Both the formatting and style of the data should be identical to improve your local SEO. Having a clickable phone number on your site can be a lead-generating machine. Check out how to get more phone calls from your website to get visitors on the line and then IN your line! Once you have content, you need to make sure that it’s going to come up in local searches to drive people to your site and location. That’s done through on-page SEO. Customer reviews are a great way to improve your local search rankings. Don’t limit yourself to Google reviews. Different platforms use different ranking systems for different reasons and they all have a positive result on your local search rankings. If you want to increase the number of reviews you’re getting, it can help to offer an incentive, like a discount or a free product, to customers who leave a review. You’ll also want to make it super easy to leave a review. Include step-by-step directions on your website and make the review process simple and short. 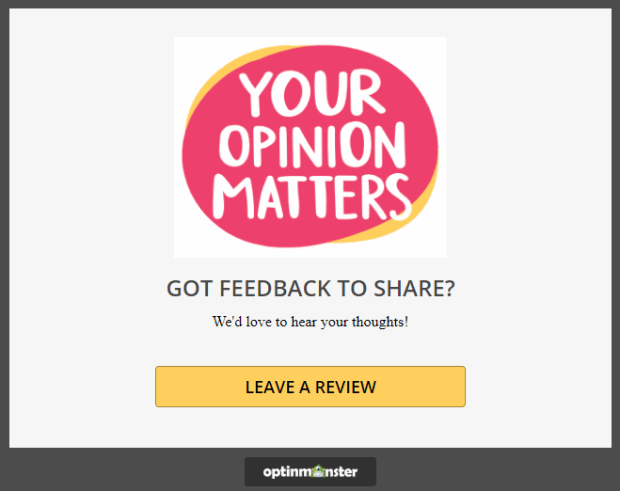 You can use OptinMonster to create a popup asking visitors to leave a review. Couple that with WPForms and you’ve got yourself a super simple way to capture tons of high-quality reviews. You can use a combination of GPS coordinates and location-based tracking features that we enable in our mobile devices and apps to set up a hyperlocal targeted ad area. This kind of targeting can result in a higher advertising ROI and more sales! So, how do you do it? Set up your boundary and then use triggers that will send users text messages, app notifications, email alerts, and more to their mobile device when the user enters that boundary. If you’ve got money to burn, here are 4 really cool ways you can use location-based advertising to target mobile users, guiding them to your storefront when they’re most likely to buy. This is the most obvious use of location-based advertising. To do this, you’d set your boundary within a certain distance of your location and use your existing customer knowledge to set the rest of your criteria for your ad. Business-to-business (B2B) companies and service providers may want to take special notice of this approach to location-based advertising. If there’s an event or conference going on in your city, why not take advantage of the increase of people in that area by running a location ad targeted in the area of the event or areas associated with the event like airports, hotels, bars partnered with the event, etc? This is an excellent way to get bottom-of-the-funnel traffic that’s ready to buy into your store to make their purchase. If you have competitors that you outshine in a special way, run a location-based ad in their location highlighting the advantage of shopping with you to pull shoppers to your store. Targeting users who are traveling is a must. People who are traveling usually have a lot of free time and are just looking for ways to fill it. For these ads, you’ll want to target tourist-heavy areas like airports, hotels, and attractions. Ads like this would work even better if you could partner with other businesses to offer discounts to tourist favorites in your city. 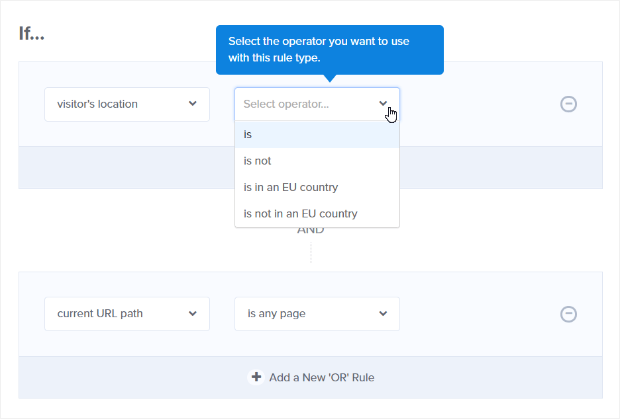 If you’re looking for a way to target visitors to your site based on their location, OptinMonster’s got you covered, and for a lot cheaper than running targeted ads like the ones we just covered. Our awesome geolocation targeting features make it really easy to use location to boost sales. That’s exactly what our customer Skates.co.uk did. Using geotargeting, Skates.co.uk was able to increase revenue by £2000 revenue per day during the holiday season. They were even able to reduce their bounce rates after adding their geotargeted optins. There you have it, folks. 8 awesome ways to boost your sales with hyperlocal marketing. Be sure to wrap up your ad copy with just the right call to action. And, if you’re ready to take your eCommerce sales to the next level, check out these eCommerce marketing strategies to skyrocket conversions. Want more tips, tricks, and tools to get your business booming? Follow us on YouTube, Facebook, and Twitter! Thanks, Daniel! I’ll check it out!